Facebook is identity: Everyone is “on Facebook.” (Facebook is growing in some countries by almost one percent a week; see the daily statistics here.) The consequences of that are two-fold: increasingly no young person who wants a social life can afford NOT to be active on the site, and being active on the site means living one’s life on the site – from maintaining one’s own image, to tagging friends’ photos, to gaming… or even “stalking people on my Facebook,” as one U.S.-based student noted. No such thing as parallel processing with Facebook: In the Unplugged experiment students reported that they came to realize that they weren’t great at parallel processing: Facebook running in the background of their computer or on their mobiles during class, meant that they had a diminished ability to write well or understand what the professor was saying. Constant connection: Facebook, most students reported, is a means of communication between friends and family who they see everyday, as well as those who they don’t get a chance to interact with on a daily basis. 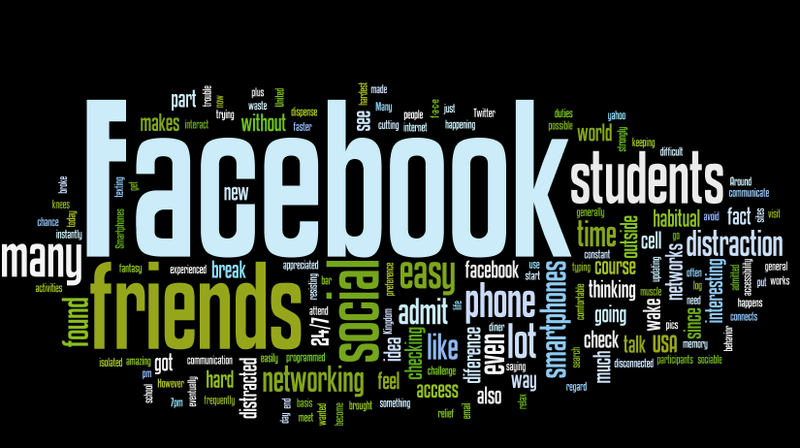 Most students reported that Facebook is the way they keep up with their social group. To be off-line was to be in proverbial exile – out in the cold. Lebanon: “First up was drafting a list of things I needed to do before unplugging. Students also reported using Facebook to keeping up with their friends in other countries and what they’re doing. Easy – and almost unconscious – access: Many students across the globe reported in their reflections that without access to Facebook they feel cut off, isolated and disconnected from friends, families and life in general. Because smartphones and laptops make easy access to Facebook and other social networks possible, many students reported that checking their Facebook accounts has become habitual – to the point that sometimes they don’t even realize they’re doing it. UK: “From my lack of social networking I had no idea what people were up to, no idea what was happening and generally didn’t know what to do with myself. I even often found myself thinking of status’s I could put if I was to go on. Unplugging: Facing the fact of ‘addiction’: Multitasking is the apparent simultaneous performance of two or more tasks; parallel processing is the ability to carry out multiple operations or tasks simultaneously. The difference is the word ‘apparent.’ Many students admitted that although they had been aware that Facebook had become a tremendous distraction, they hadn’t been fully aware of how much time they committed to the site and how poorly they actually were able to parallel process. Students also noted that during the 24 hours that they went unplugged, they focused on their friends the “entire time” they were with physically with them, “instead of refreshing Facebook every 15 seconds.” Some liked the in-depth personal contact, others liked the unplugged experiment because they felt it absolved them from having to keep up with their Facebook friends. But no one swore off of social media as a result of the experiment – that would have been “social suicide,” as students said. “It must have taken me nearly three hours to catch myself up through my phone, email and Facebook,” noted one student just off the assignment. Mexico: “It was also interesting how much I did not feel the need or desperation to check out my social pages. In this regard it was very easy.